Shop The Shoe Mart online at TheShoeMart.com for the largest selection of sought after brands with the highest quality, selection of sizes and widths. The Shoe Mart has over 30,000 pairs of Shoes from size 5 to 20 and widths as wide as EEEEEE in stock. 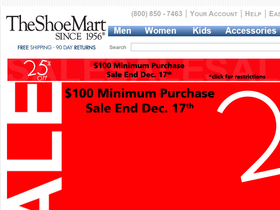 Save on your next purchase from TheShoeMart.com with discounts, coupons, promotions and savings from 58coupons.com. Enjoy free shipping on every order from TheShoeMart.com. Click link to start shopping. Save up to 30% on Mens Italian Shoes by Santoni from TheShoeMart.com. Click link to view them now! Womens Patagonia shoes 60% off from The Shoe Mart. Click link to see all the different styles. Find select Moreschi Mens Italian Shoes 60% off at The Shoe Mart. Click link to view these well made shoes. Hurry on over to TheShoeMart.com to save 30% on New Balance Shoes for men & women. Click link to view styles. Head on over to The Shoe Mart to save 20% on select money clips. Click link to get started.